Native Americans had many uses for beautberry, both internally and externally. According to Taylor (1940), Native Americans used beautyberry externally as a steam and topical application. All parts of the plants were used for different purposes Roots, leaves, and berries became the base for various teas and decoctions created to treated a wide variety of common aliments. It was also used for ceremonial activities. Crushed berries were rubbed on the skin to repel mosquitoes. In modern times, farmers and ranchers in Texas applied the berries and leaves to cattle and horses in order to repel flies. 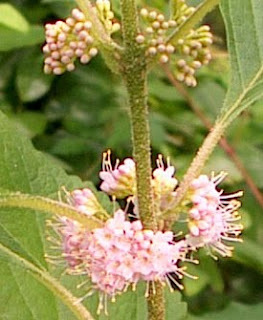 A study by Kinghorn (2008) confirms that Callicarpa Americana does have mosquito bite deterrent actions. Callicarpa leaves contain terpenoids that repel fire ants according to a recent study by Chen, Cantrell, Duke, and Allen (2008). Other ethno botanical uses: Native Americans used Callicarpa americana for ceremonial uses. William Bartram recorded Native Americans cultivating Callicarpa americana in Georgia and Northeast Florida during his botanical expeditions of the 1740s. 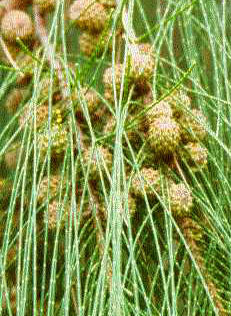 The plant has been use to produce dye and fish poison. Austin documents that traditional uses of related Mexican species include making of rafters and supports for bean vines. Today we enjoy beautyberry for its other wonderful features: berries, delicate flowers, drought resistance and value to wildlife. And now is the time! 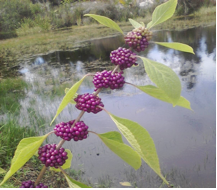 Go out into any natural area, or any neighborhood where people are savvy about native plants, and you will behold the amazing beautyberry in all its glory. The berries, which you may see at almost any time of year, are coming into their peak season right now sporting brilliant red to magenta swirls of tightly clustered little globes. Beautyberry occurs naturally over a wide portion of the southeastern United States, which, as you might deduce, means that it is highly tolerant of a variety of conditions. It likes to pop up at the forest edges where it gets plenty of light with a bit of shade. Beautyberry is an"easy keeper." Once established, it is very drought tolerant, but does need good drainage. If left on its own it reaches heights of 5 to 9 feet, frequently as wide as it is high. The natural shape is something of a mound form with gracefully arching branches. Beautyberry also can be planted in amongst other shrubs where it will stretch up and out to reach light. Callicarpa, berries on ends, stretching up in with serenoa repens, necklace pod and gumbo limbo. The flower bloom occurs most typically from mid spring to mid summer; in white, pale pink, lavender, violet; short lived flowers; small; whirled clusters called cymes. They are very attractive to butterflies. Callicarpa is easy to propagate from hardwood cuttings or seed. In fact birds scatter the seed everywhere! It is not hard at all, though, to pull up seedlings if they are dropped where you don't want one. If planting seeds, remove the fleshy part and scarify the seed. Highly recommended plant! I love these shrubs in the landscape and they do tolerate pruning if necessary. Prune one cane at a time to control size, otherwise be prepared for a large shrub. The berries are unbelievably purple. A friend of mine gave me a white beautyberry. Do you know if they're native also? I'd love to plant more of them, but only if they're native. I forgot to talk about the whites, thanks for bringing it up! Yes, although less common, the whites are also native. In my experience they tend to be somewhat less thrifty/abundant then the purples, but still a nice contrast in the garden. Thanks for your support of natives, and happy gardening. Great, thanks! I'll have to save some seeds and plant more whites! I'm so into beautyberry! Thanks for all the info! Great information. I took some photos of one of these in the Anne Kolb Nature Reserve in Hollywood Florida, but had no idea what it was. A bit of searching on Google and up popped your photos. I took a photo of them at Blue Spring State Park but had no idea what they were. Google led me here. Are the berries poisonous to any animals? I live on the beach and there are beach cats and peacocks all over. I wouldn't want to plant anything that may hurt them. Here's the link to my Beautyberry Jelly recipe - really easy and very tasty! Thanks for sharing, Stefanie! I know more than a few of our Facebook fans will be interested in trying this as well. I assume chickens can eat them if you know that wild birds eat them...? I'm not a chicken dietitian, but I think that's a safe assumption! i have one that grew up in the wrong place. can you transplant a large bush? how do you propagate? Yes, you can transplant it, but WHEN you transplant it is a critical factor to successful transplantation. Wait until late fall/early winter in your area (assuming you are in Florida) to do so. You can root-prune about halfway around it now, though, to prepare the plant for moving, but don't go overboard. Reduce the top growth to about 1' before relocating it to minimize stress. Beautyberry can be propagated by softwood cuttings or seed. You are more likely to successfully propagate softwood cuttings than you are to get beautyberry seeds to grow; germination percentage is typically pretty low for this species. I have found that most cuttings benefit from a dip in rooting hormone. Hi, my family and I found a bunch of these on our trail walk yesterday in SW fl. We were afraid they were poisonous, so we admired from afar. Just googled it and got your blog!! My questions is: Can I take a stem and grow roots to plant some on my property? Beautyberry can certainly be propagated from softwood cuttings. I recommend dipping the cut end in a rooting hormone (rootone or something similar) for better results. Also, do not let the cutting dry out completely. Glad you found our page. Good luck! I'm not sure what the most practical way is to go about removing a large quantity of this plant. For starters, you should bear in mind that the berries are eaten by many birds, armadillo, foxes, opossum, raccoon, squirrels and deer so they are a vector for its seed. Cut the plants back during the summer to curb fruit production. After that, you can either dig the plants up or, I imagine, you can treat them with a brush killer. Even with treatment, you will still have to dig them up to get rid of them completely, so you'd probably be better off eliminating toxic chemicals from the process. I am so thankful this post was here... my kids were wandering on our rural property here in N.E. FL and they brought me a branch with these berries on them.. then admitted to eating some first. I panicked because I didn't know if they were harmful or not! I was relieved to see they are not.. and what interesting information I found on them! I turned a scare into a lesson for the kids. First - don't eat anything without checking with Mom first! Second, the info about Indians and how they used the plant & berries, and the medicinal qualities they have. Good stuff! They should be fine. Many different types of wildlife (including mammals, birds, etc) are very fond of the berries and gobble them up without negative consequences. I just looked this plant up. I had no idea what it was. I live on 10 acres and this plant is everywhere on my property. I do mean everywhere. I thought it was some kind of weed. Now that I know I will leave it alone for the animals. We came out to find a number of branches bitten off and laying on the ground as if someone used pruning shears on each bush ! what do you think is the culprit and why ?? I just found this on our 6 acre property today. Nice to know some of its uses and is so pretty! I'd love to repell the fire ants, got bit 7 times in the last two weeks. I planted these by the basement stair railing on Long Island because I saw them in a nursery and they were gorgeous! Had no idea they were native to Florida! Now I am back home in Florida and plan on using them in my landscape here!